AOE-Online for Games for Windows - but is it too little, too late? Microsoft has backed up its long-standing defence that it is still engaged in PC gaming with a trio of game announcements at Gamescon that will all serve to boost 'Games for Windows'. Microsoft has responded to criticism of its increasing focus on Xbox to the detriment of the Windows gaming platform by insisting that it has not forgotten its biggest gaming audience. Fable III has been the cornerstone of this argument, although the decision to launch on the Xbox exclusively and then come to PC has served to undermine this somewhat. However, Microsoft is hoping that the announcement of Age of Empires Online – tapping into one of its most famous game franchises – alongside an updated flight sim called simply Microsoft Flight and the latest Fable will begin the lengthy journey of persuading people that it still cares. "With more than 20 million copies sold worldwide, the Age of Empires series redefined real-time strategy games for Windows-based PC players," said Microsoft. "Now, the timeless franchise once again invites players to experience its rich storyline in new ways. Age of Empires Online will invite players to create a living, growing online world, shared with friends and friendly rivals around the globe. 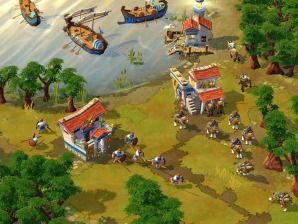 "Together with the Games for Windows – LIVE service, Age of Empires Online delivers a rich, social experience that lets you play however you want — anywhere, any time." Microsoft insists that the games are all designed with Games for Windows – Live "at the core". "Log in with a single identity to earn Achievements and up your Gamerscore across Games for Windows – LIVE and Xbox LIVE," adds Microsoft's release. "See your friends online, send and receive voice messages, text messages and game invites, and enjoy cross-platform communication. "You even receive automatic game updates and the ability to extend the experience with Game Add-ons only found on the Games for Windows – LIVE Marketplace." With Valve's Steam already offering much of this functionality, and PC gamers already disgruntled with Microsoft, it remains to be seen if this strategy will gain any real traction.